Cook rice (or cauliflower rice) if serving with stir fry. I prefer this method from Saveur.Next wipe portobello mushrooms clean with a slightly damp towel (do not immerse in water or they will get soggy) and slice into thin strips (see photo).Prepare marinade by adding all ingredients to a small mixing bowl and whisking to combine. Taste and adjust flavor as needed, adding more ginger for brightness, lime juice for acidity, tamari for saltiness, red pepper flake for heat, or maple syrup for sweetness. Add portobello mushrooms to a large shallow dish, such as a 9x13-inch baking pan, and top with marinade. Gently stir/toss to combine. Set aside to marinate for 10-12 minutes while you prep your vegetables. Toss occasionally to evenly coat.Chop vegetables as set aside. Once portobellos marinated, heat a large skillet over medium heat and add a bit of sesame oil. Then add only as many portobellos will fit comfortably in the pan (see photo), and saut for 2-4 minutes on each side, or until golden brown and slightly seared. You may have to do this in two batches depending on the size of your pan.Set portobellos aside and loosely cover to keep warm. Then add red pepper and broccolini to the pan and increase heat to medium-high. Saut for 2-3 minutes, stirring frequently. Add the green onion (optional) and any remaining portobello marinade and toss to coat. Cook for 1 minute. Then remove from heat and serve immediately. 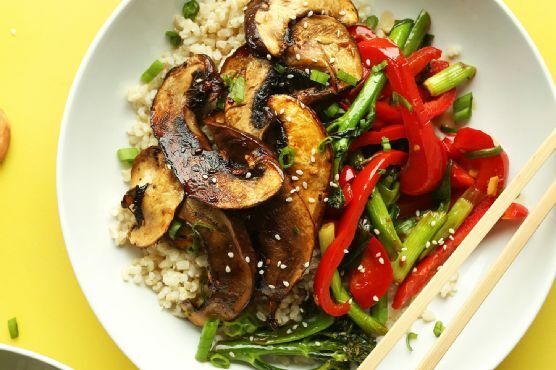 Cooking the vegetables for a short time on very high heat will give them a nice sear and prevent them from getting soggy.Enjoy as is, with chili garlic sauce, sesame seeds, or a garnish of chopped green onion. Best when fresh, though leftovers keep in the refrigerator up to 2-3 days. Reheat in the microwave or the stovetop.